Risk for Aspiration: At risk for entry of gastrointestinal secretions, oropharyngeal secretion, solids, or fluids into tracheobronchial passages. Aspiration is breathing in a foreign object such as foods or liquids into the trachea and lungs and happens when protective reflexes are reduced or jeopardized. An infection that develops after an entry of food, liquid, or vomit into the lungs can result in aspiration pneumonia. Inhaling chemical fumes or breathing in and choking on certain chemicals, even small amounts of gastric acids can damage lung tissue, resulting in chemical pneumonitis. Many household and industrial chemicals can produce both an acute and a chronic form of inflammation in the lungs which can place patients at risk for aspiration. Acute conditions, like postanesthesia effects from surgery or diagnostic tests, happen predominantly in the acute care setting. Chronic conditions, like altered consciousness from head injury, spinal cord injury, neuromuscular weakness, hemiplegia, and dysphagia from stroke, use of tube feedings for nutrition, and artificial airway devices such as tracheostomies, may be experienced in the home, rehabilitative, or hospital setting. Prevention is the main goal when caring for patients at risk for aspiration. Evidence shows that one of the principal precautionary measures for aspiration is placing at-risk patients in a semirecumbent position. Other measures include compensating for absent reflexes, assessing feeding tube placement, identifying delayed stomach emptying, and managing effects of prolonged intubation. Patient is free of signs of aspiration and the risk of aspiration is decreased. Patient expectorates clear secretions and is free of aspiration. Patient maintains a patent airway with normal breath sounds. Patient swallows and digests oral, nasogastric, or gastric feeding without aspiration. 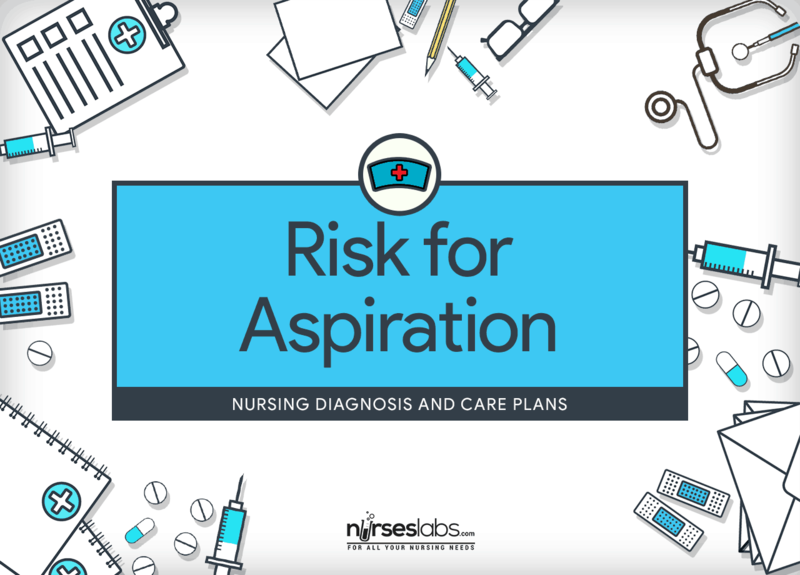 Assessment is required in order to distinguish possible problems that may have lead to aspiration as well as name any episode that may occur during nursing care. Assess level of consciousness. The primary risk factor of aspiration is decreased level of consciousness. Monitor respiratory rate, depth, and effort. Note any signs of aspiration such as dyspnea, cough, cyanosis, wheezing, or fever. Signs of aspiration should be identified as soon as possible to prevent further aspiration and to initiate treatment that can be life-saving. Impaired swallowing increases the risk for aspiration. There remains a need for valid and easy-to-use methods to screen for aspiration risk. Review results of swallowing studies as ordered. For high-risk patients, performance of a videofluoroscopic swallowing study may be indicated to determine the nature and extent of any swallowing abnormality. Assess for presence of nausea or vomiting. Nausea or vomiting places patients at great risk for aspiration, especially if the level of consciousness is compromised. Antiemetics may be required to prevent aspiration of regurgitated gastric contents. Observe for food particles in tracheal secretions in patients with tracheostomies. Food should never be present in the tracheobronchial passages. It signifies aspirated material. Auscultate bowel sounds to assess for gastrointestinal motility. Reduced gastrointestinal motility increases the risk of aspiration as fluids and food build up in the stomach. Further, elderly patients have a decrease in esophageal motility, which delays esophageal emptying. When combined with the weaker gag reflex of older patients, aspiration is at higher risk. Assess pulmonary status for clinical evidence of aspiration. Auscultate breath sounds noting for crackles and rhonchi. Monitor chest x-ray films as ordered. Aspiration of small amounts can happen with sudden onset of respiratory distress or without coughing particularly in patients with diminished levels of consciousness. Pulmonary infiltrates on chest x-ray films indicate some level of aspiration has already occurred. Monitor the effectiveness of the cuff in patients with endotracheal or tracheostomy tubes. An ineffective cuff can increase the risk of aspiration. Work together with the respiratory therapist, as necessary, to verify cuff pressure. Check placement before feeding, using tube markings, x-ray study (most accurate), pH of gastric fluid, and color of aspirate as guides. A displaced tube may erroneously deliver tube feeding into the airway. Chest x-ray verification of accurate tube placement is most reliable. Gastric aspirate is usually green, brown, clear, or colorless, with a pH between 1 and 5. Test sputum with glucose oxidase reagent strips. Significant amounts of glucose in sputum may be indicative of aspiration. Check residuals before feeding, or every 4 hours if feeding is continuous. Hold feedings if amount of residuals is large, and notify the physician. Large amounts of residuals indicate delayed gastric emptying and can cause distention of the stomach, leading to reflux emesis. The amount of residuals may vary depending on the volume and rate of infusion; however, the evaluation can be unreliable. Feedings are often held if residual volume is greater than 50% of the amount to be delivered in 1 hour. Assess the patient and family for willingness and cognitive ability to learn and cope with swallowing, feeding, and related disorders. Food and feeding habits may be strongly tied to family cultural values. Acknowledgment and/or adjustment to cultural values can facilitate compliance and successful family coping. Keep suction machine available when feeding high-risk patients. If aspiration does occur, suction immediately. A patient with aspiration needs immediate suctioning and will need further lifesaving interventions such as intubation. Inform the physician or other health care provider instantly of noted decrease in cough/gag reflexes or difficulty in swallowing. Early intervention protects the patient’s airway and prevents aspiration. Anyone identified as being at high risk for aspiration should be kept NPO (nothing by mouth) until further evaluation is completed. Keep head of bed elevated when feeding and for at least a half hour afterward. Maintaining a sitting position after meals may help decrease aspiration pneumonia in the elderly. Position patients with a decreased level of consciousness on their side. This positioning (rescue positioning) decreases the risk for aspiration by promoting the drainage of secretions out of the mouth instead of down the pharynx, where they could be aspirated. Supervise or aid the patient with oral intake. Never give oral fluids to a comatose patient. Supervision helps identify abnormalities early and allows implementation of strategies for safe swallowing. Withholding fluids and foods as needed prevents aspiration. Provide foods with consistency that the patient can swallow. Use thickening agents if recommended by a speech pathologist or dietician. Thickened semisolid foods such as pudding and hot cereal are most easily swallowed and less likely to be aspirated. Liquids and thin foods (e.g., creamed soups) are most difficult for patients with dysphagia. Allow the patient to chew thoroughly and eat slowly during meals. Well-masticated food is easier to swallow, food cut into small pieces may also be easier to swallow. Note new onset of abdominal distention or increased rigidity of abdomen. Abdominal distention or rigidity can be associated with paralytic or mechanical obstruction and an increased likelihood of vomiting and aspiration. For patients with reduced cognitive abilities, eliminate distracting stimuli during mealtimes. Tell the patient not to talk while eating. Concentration must be focused on chewing and swallowing. There is a higher risk for the airway to be opened when talking and eating at the same time. Place medication and food on the strong side of the mouth when unilateral weakness or paresis is present. Careful food placement promotes chewing and successful swallowing. Offer liquids after food is eaten. Ingesting food and fluids together increases swallowing difficulties. Place whole or crushed pills in soft foods (e.g., custard). Verify with a pharmacist which pills should not be crushed. Mixing pills with food helps reduce risk for aspiration. Stop continual feeding temporarily when turning or moving patient. When turning or moving a patient, it is difficult to keep the head elevated to prevent regurgitation and possible aspiration. Provide oral care before and after meals. Oral care before meals reduces bacterial counts in the oral cavity. Oral care after eating removes residual food that could be aspirated at a later time. Perform oral suctioning as needed. Suctioning reduces the volume of oropharyngeal secretions and reduces aspiration risk. Brush teeth twice a day, and swab mouth with sponge applicators every 2 to 4 hours between brushing. Oral care reduces the risk for ventilator-associated pneumonia by decreasing the number of microorganisms in aspirated oropharyngeal secretions. If ordered by physician, put several drops of blue or green food coloring in tube feeding to help indicate aspiration. In addition, test the glucose in tracheobronchial secretions to detect aspiration of enteral feedings. Colored secretions suctioned or coughed from the respiratory tract indicate aspiration. Elevate the head of bed to 30 to 45 degrees while feeding the patient and for 30 to 45 minutes afterward if feeding is intermittent. Turn off the feeding before lowering the head of bed. Patients with continuous feedings should be in an upright position. Upright positioning reduces aspiration by decreasing reflux of gastric contents. Consult a speech pathologist, as appropriate. A speech pathologist can be consulted to perform a dysphagia assessment that helps determine the need for videofluoroscopy or modified barium swallow and to establish specific techniques to prevent aspiration in patients with impaired swallowing. For patients at high risk for aspiration, obtain complete information from the discharging institution regarding institutional management. Continuity of care can prevent unnecessary stress for the patient and family and can facilitate successful management in the home setting. Establish emergency and contingency plans for care of patient. Clinical safety of patient between visits is a primary goal of home care nursing. Educate the patient and family the need for proper positioning. Upright positioning decreases the risk for aspiration. Instruct in signs and symptoms of aspiration. Information helps in appropriate assessment of high-risk situations and determination of when to call for further evaluation. Demonstrate on suctioning techniques to prevent accumulation of secretions in the oral cavity. Respiratory aspiration requires prompt action to maintain the airway and promote effective breathing and gas exchange. Refer the patient to a home health nurse, rehabilitation specialist, or occupational therapist as indicated. Use of consultants may be required to ensure outcomes are achieved.